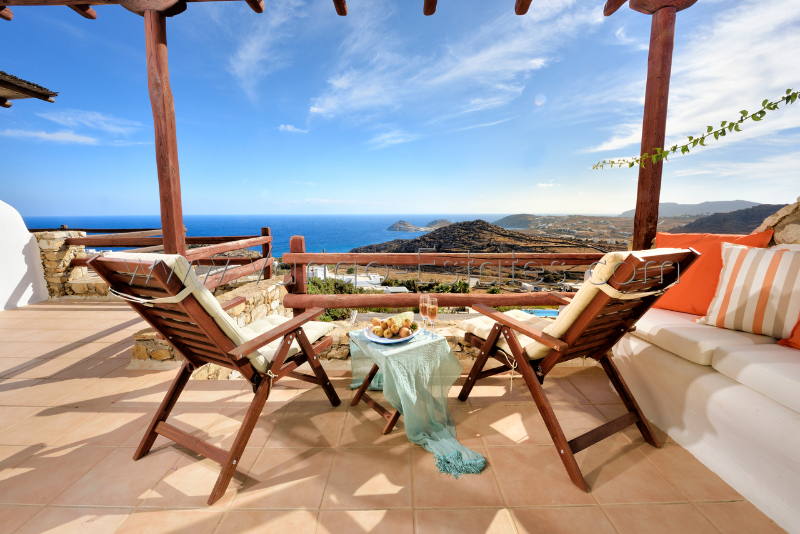 Mykonos Lia Complex house; in the south eastern part of the island, a beautiful 3-story fully-equipped townhouse in a complex of 7 houses with breath-taking views of the Aegean Sea, beautifully landscaped surrounding areas and a shared “infinity” pool. The property is ideal for couples, families with children or simply friends. 1st level: 2 bedrooms, 1 double and 1 with 4 beds (1 double with en-suite bathroom; the other one has bunked bed and a sofa bed for another 2 children or 1 adult); 2nd level: living room and kitchen with eating area with A/C, 3rd level: 1 double bedroom with en-suite bathroom, A/C. All 3 levels overlook the pool and the sea. WiFi, Parking, 24 hour guard, every 2nd day cleaning team, change of linen every 3rd day, 2 km from Ano Mera for shopping/banking needs. 750 m from the exquisite Lia beach ; in front of the traditional fishermen village of Kalafati, and 4 km from Kalafati beach, perfect for swimming and surfing; water sports (scuba diving, surfing schools), a variety of restaurants by the beach. An adjacent house may also be available in case of larger groups.